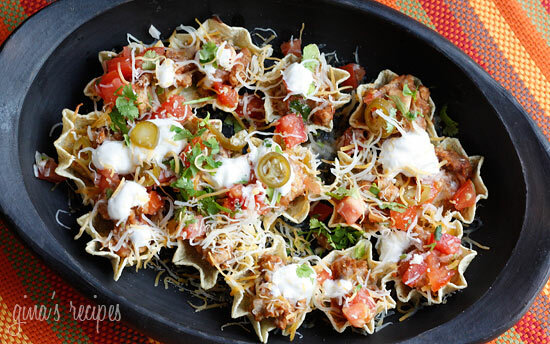 To celebrate Cinco De Mayo, or any day, enjoy these loaded nachos without the guilt.
. I made some adjustments to his original recipe and it was DELICIOUS. High in fiber and lower in fat than regular nachos, which would be about 22 points if you ate these out. Place 1 oz (about 14) chips on four oven-proof dishes or one large baking sheet. Heat a large nonstick sauté pan over high heat. Season with cumin, garlic powder, salt and pepper and sauté until cooked through, breaking up meat into small pieces with a wooden spoon. When cooked, add bean dip and mix well. Spoon the turkey mixture over the chips and sprinkle the cheese on top. Bake until cheese melts, about 6 minutes. 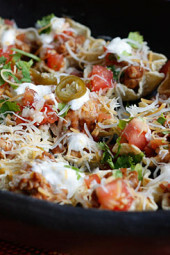 Remove the nachos from the oven, top with pico de gallo, sour cream, cilantro and jalepeños. I didn’t read the full recipe until after buying the turkey breast. Now I’m home and thinking it’s a mistake and should read ground turkey in the list of ingredients? I want to make sure I got this straight. Each plate gets 14 chips? How much turkey goes on each plate? 2oz? This was an instant favorite in my house. We modify it by using lean ground beef instead of turkey and Gina's guacamole instead of the bean dip. So yummy! These are wonderful!! I replaced the bean dip with refried black beans, yummy! Woman, you are killing me. These were so good. Love 'em. My son wouldn't eat them, but he has a weird aversion to beans, and I didn't even tell him about the beans, he just knew!! But he's weird like that!! LOL he didn't get it from me. I took this recipe and made it into a salad. What a great idea to use black bean dip (which is super easy to make), Gina! I usually use nonfat refried beans but this was so much better! I Also removed the cheese and replaced it with avocado instead. Sort of removed the whole nacho theme when removing the cheese but I just wanted to let you know your recipes inspire the cook in me to create new things! I believe your nutritional facts on this are a lil off. No matter how I calculated it 408 calories and 50 carbs per serving were as low as I could get this recipe and that was using fat free cheddar instead of reduced fat 🙁 That was also using your pico recipe and the Guiltless Gourmet Fat Free Bean Dip and the Bakes Tostitos as you suggested. I made these last night along with two salsas, tacos, your citrus spritzer, and skinnygirl margaritas for a cinco de mayo party last night. Everything was absolutely delicious! Thank you for making our celebration that much healthier! is this made with turkey breast or ground turkey meat? thanks! These were amazing! I couldn't find the baked scoops so I used the regular ones. Points went up to 11 – still not bad for supper. I ended up buying fresh pico to save time. Simply delicious! Yummy…I make nachos by putting wonton wrappers in muffin trays and crisping them up…You get more for your points. I used canned here, but you could use either. It depends on how hot you like it. I probably used 1 tbsp. Hi Gina, just found this recipe/your site via Pinterest and am excited to explore it more. I have one question about this recipe– you mention in the directions to top the nachos with jalapenos and the picture shows them, but the ingredients list doesn't mention them. How much did you use? Were you using fresh or canned? Thanks!! Had it tonight for dinner. SO AMAZING! Gina Thank You so much for sharing your wonderful ideas! I am not currenty on a diet or weight watchers. I was looking for some tasty healthier meals to incorporate into my menus and you site if PERFECT! I made the skinny Nachos today for lunch. I had to make some substatutions based on my grocery store not having everything and my husband's pickiness but it was as close as I could get. Thanks again for all you do and keep up the good work! Ok Gina, I have to leave a comment… I have tried numerous recipes on this site and I just love everyone, This one was no exception, it's awesome!! I also tried the Prosciutto and arrugula sandwhich today, it's satisifying and tasty! I am so glad I found your site when I started weight watchers this year!! Thank you, thank you, thank you!! This was DELICIOUS!! As are many of your recipes! I have posted several to my blog to share with my friends and linked them to your blog…hope you don't mind. Your blog has been the best place I've found for low fat GOOD recipes!! Thank you for sharing with us!! I made this yesterday and my husband raved and raved about it! Nothing about it tastes low-fat. I did substitute the black bean dip for non-fat refried black beans and it was still delicious. I will DEFINITELY make this again! Such a winning recipe! I made these last night for the Super Bowl and they were a huge hit! I couldn't find the black bean dip, so instead subbed fat free refried beans. I could eat these daily! Thank you! I made this a couple of days ago and boy oh boy! They were great! The portion is HUGE though! I put leftovers in a bag and they were even great the next day! Thank you Gina! you are a life saver! I have been looking everywhere for recipes that are healthy and that are delicious. So far everything that i have made from your site has been some of the best dishes I have cooked. Making this tonight, and I know it will be UHMAZING! Super yummy! so glad I found your blog! I didnt have the bean dip so i took a cup of black beans and pureed it with some of the pico de gallo! FAB! How do you figure out all the WW points?! Would it be lowered if one used half yogurt and half sour cream and/or all just yogurt. Have you tried it that way? @Steffy, that's great!! You really don't have to count points to lose, it's all about making lighter choices. Thanks for the comment!! I absolutely love your site! I'm not on WW, but I was looking for a way to lighten up my style of cooking (since I grew up in the south and it's hard for me to not have a heavy hand with butter!) Your food is delicious and this was no exception! My hubby and I have already lost 20 pounds! Thanks so much for all your hard work! I made this and thought it was great! I shared it on my blog and linked back to you!! Thanks for the recipe!! @Jilie- That's right, 1 oz baked tostitos scoops are 14 chips. The photo is one serving. It's a meal! Hi Gina, these look so great. I am a little confused though – 1 serving is the 14 chips that you have pictured? so if the recipe calls for 4oz of chips for 4 servings then 14 chips is 1oz and your picture shows one full serving? it just seems like so much for 7pts – but I would love it! Wonderful, delicious treat! Why did I ever eat fully fatty nachos when I could have had these? Thanks so much! 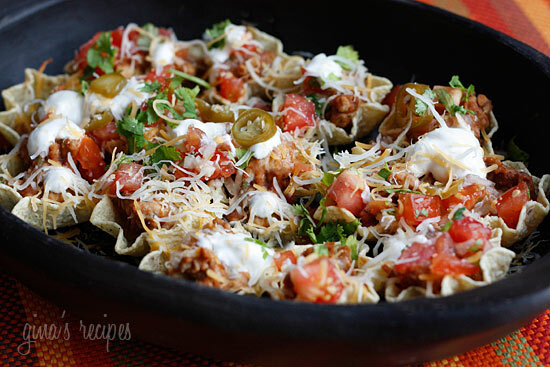 LOVE the idea of making these with Chicken Ropa Vieja!!! These were great. I changed it up a little because I had left over Chicken Ropa Vieja, so I used that in place of the ground turkey. My husband loved it. Thanks for all the great ideas. YUM! that looks so good and pleasing for anyone! The bean dip you buy in the store. Usually in the chips and salsa aisle. Guiltless Gourmet is the brand I used but I saw others. If you can't find it, fat free refried beans would work. Is the bean dip a recipe too? Or is it something I can buy from the store? They look so Yummy! I can't wait to try them! I'm sure it would be fine with beans, the bean dip is pureed and is a little spicy and has a wonderful lime flavor. Is there a brand of the spicy black bean dip that you can recommend? Would it be OK to use 1 cup of black beans straight out of the can, as opposed to the bean dip? My sister and I had these tonight. Absolutely AMAZING! Thank you again for another fantastic recipe! This doesn't look remotely low-fat! LOVELY. I'll be back here! Love these recipes. Re: @Anonymous's turkey vs. 98% lean ground beef question — the fat content 98% lean ground beef actually is slightly lower than most ground turkey. I think that's what @Anonymous was saying. I believe, but am not sure, that ground turkey breast may have less fat than either regular ground turkey or 98% lean ground beef. Because the 98% lean ground beef does have similar fat content to ground turkey, I often choose it for this type of recipe. Turkey and beef have different nutrients, and in general, beef has more of what I need. In my opinion, it really comes down to personal preference. Oh these look so yummy! Those look awesome Gina! I know that Joseph would love them as well, Going to try them soon. Gina, did you use shredded turkey breast or ground turkey? Thanks! Yum! These nachos look so good! Hope to make them soon! SO EXCITED about trying this!!! LOVE nachos!!! I have started making my own tortilla chips by cutting up regular corn tortillas and baking them in the oven with a little salt and Pam sprayed on them. I think they must be even healthier than a pre-packaged baked chip, plus they are nice and thick and crunchy — so satisfying! These look perfect for my Happy Hour Friday posts. Tried the Thai Coconut Curry Last week. Delicious! My husband and I are such nacho freaks and we haven't had them in a couple of years. I can't wait to make these. Maybe tonight! Thanks you!!! I'm not sure how many ounces that came to, as I have no more cheese left. Sorry! @Anonymous- I'm not sure I understand your turkey question? Thank you Gina! Can you please tell us how many ounces of cheese you used for the 1 1/3 cups? when I check the fat content of 98% lean ground meat and the fat content of it, the same for ground turkey. Do you find this true? Thanks for all the recies. I'm just getting back on ww and your a Godsend…….How is your baby? that looks awesome, i will definitely try these! !